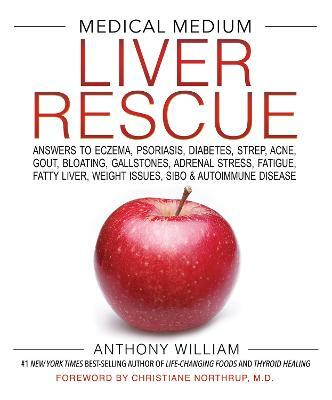 With his signature compassion, Anthony William, the Medical Medium, shares unparalleled insights into undiscovered functions of our lifesaving livers and offers detailed guidance on how to move forward so we can live our best lives. Find out for yourself what liver rescue is all ... read full description below. What if you could focus on one aspect of your well-being to prevent health problems you didn't even know were lurking beneath the surface? In today's world, we have no idea how many symptoms, conditions and diseases are rooted in an overloaded liver. Nearly every challenge - from pesky general health complaints to emotional struggles to autoimmune and chronic illnesses - has an origin in an overloaded liver and can improve when you harness the force of this humble organ. Medical Medium Liver Rescue offers the answers you should have had all along. With his signature compassion, Anthony William, the Medical Medium, shares unparalleled insights into undiscovered functions of our life-saving livers, explains what's behind dozens of health issues that hold us back and offers detailed guidance on how to heal and thrive. Find out for yourself what liver rescue is all about: being clearer-headed, more peaceful, happier and adaptable to our fast-changing times. Learn how to sleep well, balance blood sugar, lower blood pressure, lose weight, look and feel younger. A healthy liver is the ultimate de-stressor, anti-ageing ally and safeguard against a threatening world - if we give it the right support.